CD review: "Axe to Grind"
This review first appeared in the April 18, 1996 issue of the North County Times. When most 18-year-olds write a long song to their girlfriend, it's pretty private. But most 18-year-olds don't play guitar like Mike Welch, who hones his skills playing clubs in Boston, where Dan Akroyd gave him his "Monster" moniker at the tender age of 15. And so the lucky Cara has to share "Time Stands Still" with the rest of us. Two years ago, Welch put out his debut recording, "These Blues Are Mine." It was a pretty incredible recording for a 16-year-old, but understandably lacked maturity and confidence. Compared to albums by more experienced blues guitarists it was, in fact, somewhat ordinary. 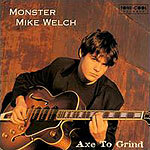 But "Axe to Grind" is a much better album  Welch's singing is more urgent, his guitar solos more biting. Most importantly, his songwriting is considerably improved. Welch's brand of the blues is of the rock shuffle variety  bright and accessible with lots of radio-friendly rock-style guitar solos. And unlike a lot of other teen-aged white guitar slingers who are being touted as the next coming of Stevie Ray Vaughan, Welch's label and management seem content to simply let the young man play, to stay within himself. The result is not the best blues album you'll ever hear, but it's a good one that, given the lack of pressure on Welch, is likely to presage even better ones down the road.